Showing 1 - 20 of 34 results. 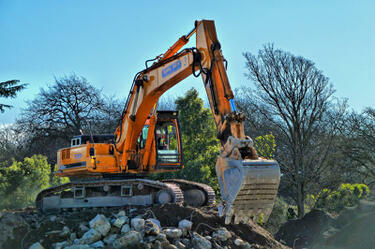 A digger works on top of a pile of soil and building rubble. A PDF copy of pages 214-215 of the book Christchurch: The Transitional City Pt IV. 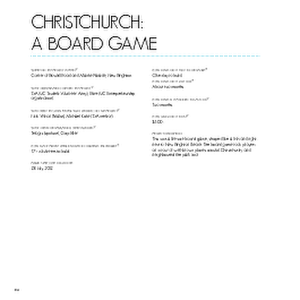 The pages document the transitional project 'Christchurch: A Board Game'. Photo (top): Peter Walker, Three Chairs Photography. With permission from Volunteer Army Foundation. Photo (bottom): Irene Boles. A photograph of bricks forming a playing square of Christchurch: A Board Game. 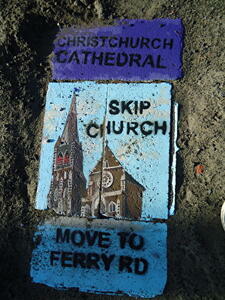 The bricks show a picture of ChristChurch Cathedral, and read, "ChristChurch Cathedral. Skip church, move to Ferry Rd". 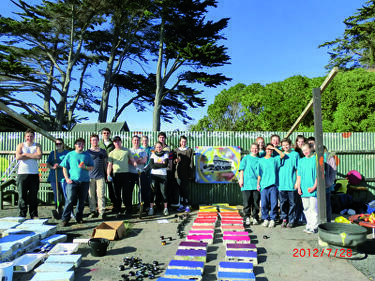 A photograph of students from the Student Volunteer Army and Entré on the site of Christchurch: A Board Game. 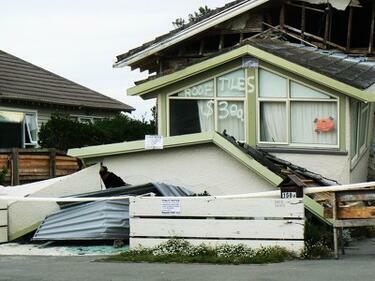 A photograph of an earthquake-damaged house on Marine Parade in North Brighton. The front section of the house has collapsed, the rest buckled. The wall of the gable has also collapsed as well as part of the lower front wall. A red sticker in the window indicates that the building is unsafe to enter. A message has been spray painted on the front window, reading, "Roof tiles, $3 each". Police tape, a road cone and saw horses have been used to cordon off the house. 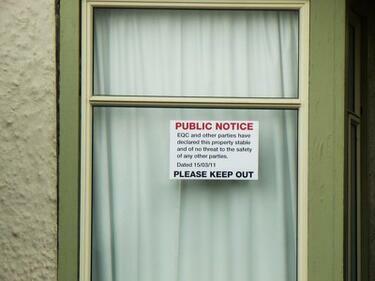 A photograph of a notice on the window of a house on Marine Parade in North Brighton. The notice reads, "Public Notice, EQC and other parties have declared this property stable and of no threat to the safety of any other parties. Dated 15/03/11. Please keep out". 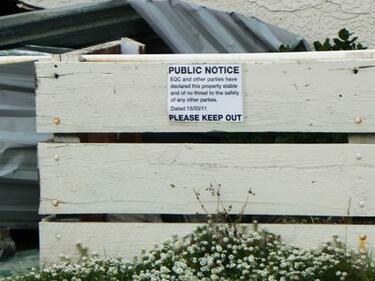 A photograph of a notice on the fence of a house on Marine Parade in North Brighton. The notice reads, "Public Notice, EQC and other parties have declared this property stable and of no threat to the safety of any other parties. Dated 15/03/11. Please keep out". 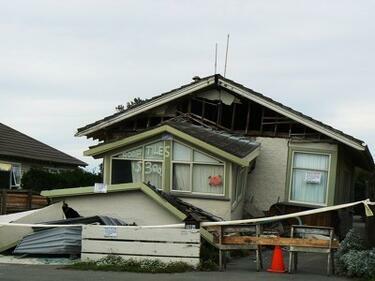 A photograph of an earthquake-damaged house on Marine Parade in North Brighton. The front section of the house has collapsed, the rest buckled. The wall of the gable has also collapsed as well as part of the lower front wall. A red sticker in the window indicates that the building is unsafe to enter. A message has been spray painted on the front window, reading, "Roof tiles, $3 each". Police tape has been used to cordon off the house. Public notices can be seen on the fence, on the roof of the collapsed section and the section behind. 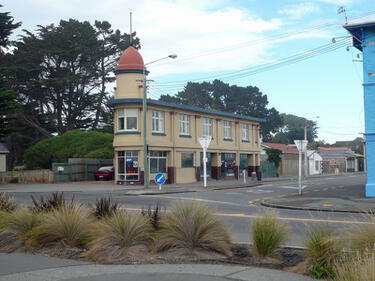 A photograph of street art on the corner of Bowhill Road and Marine Parade. 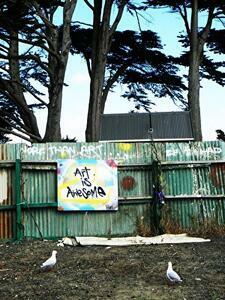 A sheet of metal has been attached to a fence, with the message, "Art is awesome". Above this, a message has been painted on the fence, reading, "More than art...". A photograph of street art on the former site of a building on the corner of Bowhill Road and Marine Parade. A collection of couches and chairs has been arranged around a piano. Behind the piano, a message has been painted on the fence. The message reads, "Beautiful. Art can make anything look amazing. A photograph of street art in the former site of a building on the corner of Bowhill Road and Marine Parade. On the left, a sheet of metal has been attached to the fence with a depiction of ChristChurch Cathedral. 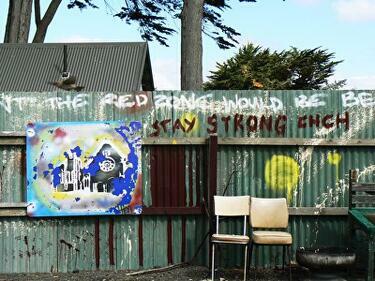 Next to the metal, "Stay strong Christchurch", has been painted on the fence. A photograph of street art attached to a fence in the former site of a building on the corner of Bowhill Road and Marine Parade. 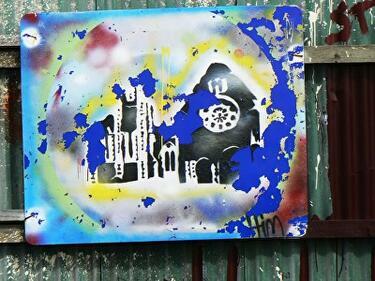 The artwork has been created on a sheet of metal and depicts ChristChurch Cathedral. 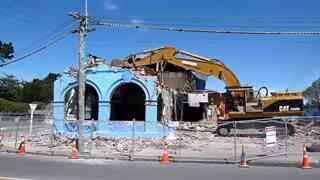 A video showing part of the demolition of the Ozone Hotel in New Brighton. Steve Taylor comments "She put up a good fight. The Ozone in New Brighton was damaged in the February earthquake in Christchurch, New Zealand. Here is the main corner of the structure being, as they say, deconstructed. At the end there is a reverent bow by the excavator. Just before this the claw had caught on the floor/ceiling and the whole building shook from side to side, but it still stayed in place." 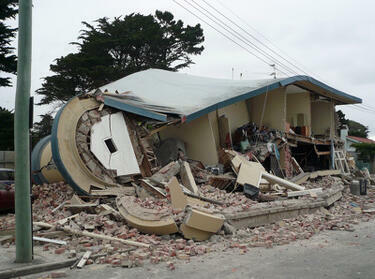 A photograph of TJ's Kasbah in North New Brighton, taken before the February 2011 earthquake. 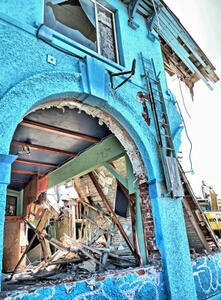 The photographer comments, "Here is what 1 Bowhill Road looked like before the Christchurch earthquake. It was called the Ozone store, which originally was incorporated in the blue Ozone building on the other side of the road". Damage to TJ's Kazbah in New Brighton. The east and north walls and part of the upper floor have collapsed, tipping rubble and the contents of the rooms out onto the street. The photographer comments, "The occupants of the business and rooms all managed to escape alive. A digger was used to make the building safe and then used to sift through the rubble for any surviving belongings. It was a very emotional time for the ex-occupants". The damaged Ozone Hotel has had its window frames removed, and the interior has been gutted. 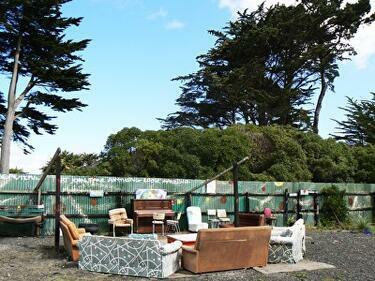 The photographer comments, "The Ozone was badly damaged in Christchurch's February earthquake, but at considerable risk someone has removed the windows and door". Graffiti on a damaged building. 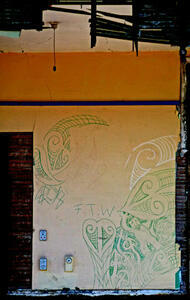 The photographer comments, "After some of the walls were demolished this graffiti was exposed. The next day this wall was gone as well". 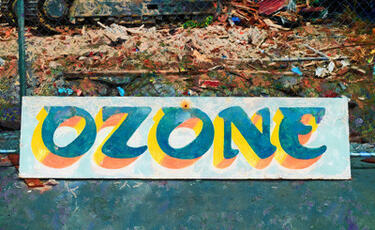 A digitally manipulated photograph of the Ozone Hotel's sign, leaning against a cordon fence. The photographer comments, "This sign was all that remained after the demolition of the historical Ozone Hotel, which was damaged in the Christchurch earthquakes. The sign disappeared so hopefully it will reappear at a later date in a museum. 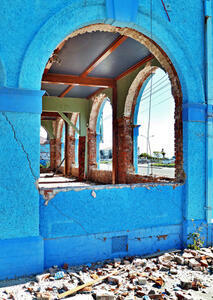 The bits of blue were the painted bricks of the hotel, which made it really stand out". The partially demolished Ozone Hotel in New Brighton, with a digger in the background. 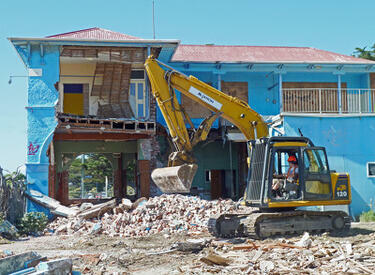 A digger demolishing the former Ozone Hotel in New Brighton. The photographer comments, "The bulldozers are starting circling the Ozone in New Brighton, Christchurch. Taking bits of flesh from the mortally wounded building".